Valentine’s Day is right around the corner. For some, it may be an exciting time of year, and for others, it may be daunting. If you’re part of the latter population, you are probably stressing out over what to buy your significant other or where to make dinner reservations. If you’re a small business owner, the holiday can mean something entirely different than candy grams and hearts – it’s a day that can be maximized for profit and foot traffic – if you plan accordingly. In this blog, we give small businesses four ideas to help you feel the love from your customers this Valentine’s Day. 1. Run a promotion: Everyone loves a good deal, especially when they’re trying to plan an impressive date. Have you considered running a holiday-specific promotion? Salons and spas can offer special packages just for couples with the goal of doubling foot traffic. Restaurants can offer prix-fixe menus for Valentine’s Day with special meals just for the holiday. You can even entice guests by offering a percentage off of their next meal for dining with you on Valentine’s Day (and this means they’ll probably come back again, which is great for customer loyalty). Throwing in a champagne toast or complimentary chocolates for each table can show you want to go the extra mile to give customers an impressive experience. 2. Create a contest: Incentives can drive awareness to your brand and inspire people to interact with you socially. Valentine’s Day is all about relationships, so consider coming up with a contest that incorporates social media. Motivate couples to share their “how we met” stories for a chance to win a free dinner or salon service. If you’re a pet service, you can ask owners to share their favorite memory with their pet for a chance to win. Ask people to use your hashtag, tag your company on social media, and share their story. Then, choose one lucky winner to enjoy the prize. Running a contest gives the potential to create buzz and engagement around your brand and can inspire more people to follow you. 3. Offer a unique event: In the era of Instagram and live-streaming, dinner and a movie may not be the most impressive date plan. Couples, millennials in particular, are always looking for the most unique way to spend a night out and share their experience on social media. As a restaurant owner, consider hosting a cooking class or series of them around Valentine’s Day. You can even host a paint and sip or floral arrangement class at your location. Giving an opportunity for couples to work together and take home a souvenir may help you stand out from the crowd. As a salon, you can host a “couples makeover” event where they can spend the day getting a whole new look. You can even consider hosting a meet and greet for singles (who says Valentine’s Day had to be all about couples anyway?) Thinking outside of the box to create an exceptional event can go a long way in attracting crowds. 4. Make it memorable: What is the last thing your guests will remember at the end of their evening with you? For many, Valentine’s Day evokes a sense of nostalgia. For others, the holiday is all about hope and looking forward to the future. Everyone has a memory of the holiday as a kid or is looking to create new ones. Play off of the nostalgia by incorporating some fun. Treats for your guests to take with them can be a great touch, or even setting up a photo booth for couples can add an extra element of fun to the night. Consider creating a special playlist to serve as a backdrop to conversation or set up a complimentary chocolate tasting for guests. Valentine’s Day only comes around once a year, so it’s a great opportunity to add another level of creativity to your marketing strategy. 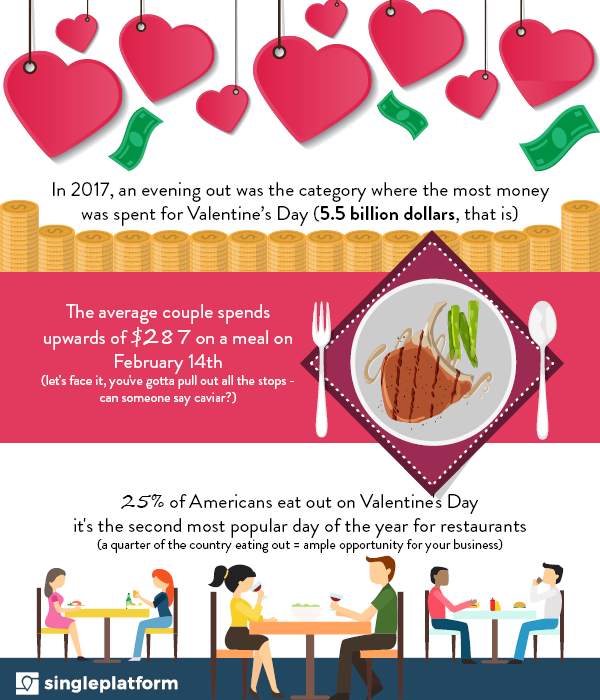 Valentine’s Day is quickly approaching, and with so much money being spent on the holiday every year, you want to make sure to maximize your potential to make a profit. Unique and creative ideas, special promotions, and the extra attention to detail can help you bring couples (and singles alike) to your location for an unforgettable night out. Hoping to get your business discovered online ahead of the holiday? Contact SinglePlatform to find out more about how we can help you stand out everywhere that matters.